Crash Bandicoot N. Sane Trilogy is kicking off this holiday season with some amazing Black Friday retail deals. With the arrival of a special bundle package and new officially-licensed loot you’ll be sure to find something for all of the Crash Bandicoot fans on your list this holiday season. 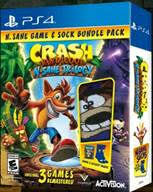 For me that was my brother and I am super excited to be able to give him a pair of Crash Bandicoot socks!! As a kid Crash, Spyro and Donkey Kong were our favorite games. I am excited many of these games are making a comeback and that I can now play with them with my boys.